US Amb. David Friedman attends mass Priestly Blessing ceremony at the Western Wall, held twice a year, during Passover and Sukkot. 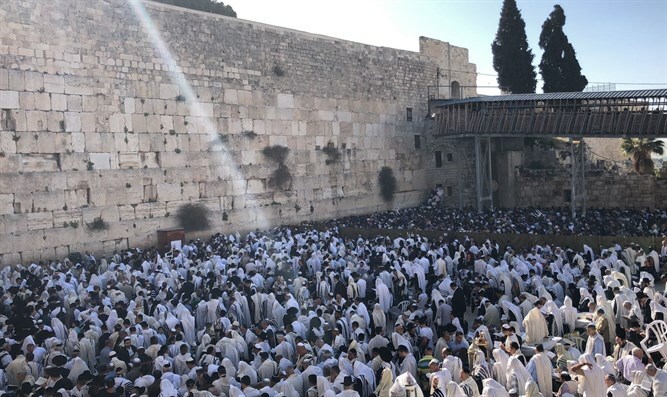 US Ambassador to Israel David Friedman on Monday morning joined tens of thousands of Jews in attending the mass blessing of the kohanim (Jewish priests) at the Western Wall plaza. Attending the prayers and ceremony are Jews, and kohanim, from all over Israel, as well as visitors from abroad. he blessing, taken from the book of Numbers, is recited by kohanim every day in Israeli synagogues, with the priests, faces covered with prayer shawls, while facing the congregation holding their hands out in a way passed on from generation to generation. Traditionally, the members of the congregation lower their heads and do not look directly at the kohanim as they are blessed. In the Diaspora, it is said only on festivals. On Sukkot and Passover, when there are intermediate days that allow for driving and microphones, the tradition of having a mass blessing with a large number of kohanim at the Kotel (Western Wall) was instituted. The words of the biblical blessing: "May the Lord bless you and keep you, May He shine His face upon you and grant you grace, May He turn His face to you and grant you peace" were found in silver amulets unearthed in an ancient 6th century B.C.E. burial site on Katef Hinom, at what is now the Begin Center in Jerusalem, opposite the Old City, by archaeologist Gabi Barkai.